Amit Shah to address a workers' convention and inaugurate a public relations office of PM Narendra Modi in Varanasi. In his first visit to Uttar Pradesh after being elevated to the post of BJP president, Amit Shah will address a workers’ convention in Lucknow on August 19 and inaugurate a public relations office of Prime Minister Narendra Modi in Varanasi. “BJP national president Amit Shah will visit Lucknow on August 19. The next day he will reach Varanasi where he will inaugurate the public relations office of Prime Minister and Varanasi MP Modi,” BJP spokesman Vijay Bahadur Pathak said. Pathak said on August 19 the BJP president would address a big convention of party workers in Lucknow. 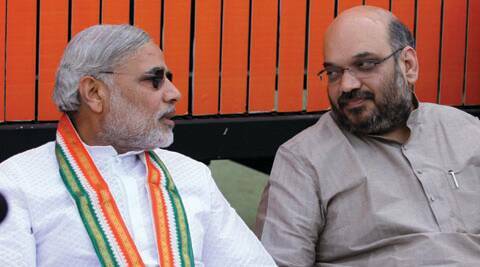 This will be Shah’s first visit to the state after he assumed charge as BJP president. Shah was in charge of party affairs in Uttar Pradesh and was believed to be instrumental in ensuring the party’s spectacular showing in the state in the last Lok Sabha election. Pathak said that on August 23 Shah would inaugurate and address the state executive meeting scheduled to be held in Vrindavan. “The state executive committee meeting of the party will be held in Vrindavan on August 23 and August 24. On August 22 a meeting of the state office-bearers is proposed in Vrindavan,” he said. Pathak said that after the executive committee meeting a two-day state level training camp would be organised from August 24 in which state office-bearers, president of frontal organisations and district presidents would participate.